2 additional bedrooms upstairs each have adjoining bathrooms. One bedroom has a queen size bed and the other bedroom has 2 twin beds. The spacious open concept floor plan has a fully equipped kitchen. The living and dining area are open to the kitchen. The dining room table seats 6. The bar area has 3 additional bar stools. 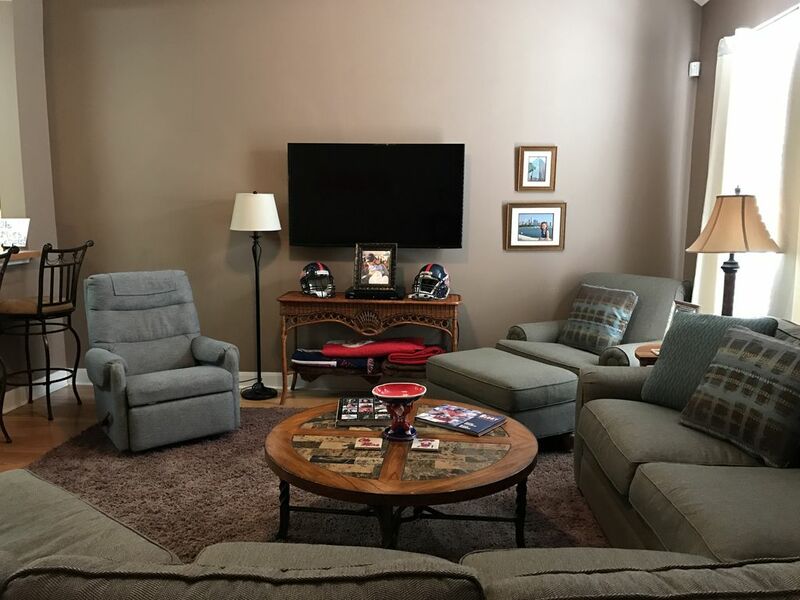 The vaulted living room has an oversized sectional. Two additional guests could easily sleep on the sectional. There is a 52" flat screen television in the living room. Satellite and wireless internet is available for your stay. There is a quaint patio with a grill available for use. The swimming pool is located directly across the street from our condo. There is also plenty of green space. Our condo has 3 reserved parking spots just out the front door. This unit was perfect for a game weekend. Decorated well and so comfy with lot's of seating for everyone!! Glad you enjoyed your stay at our place. Hope you will consider staying with us again. There is a $50 charge for each additional guest each night after 6.